The Descendants Inspired Disney Shirt makes a great gift for a birthday. Special gift for any disney fan, for both ladies or young girls. 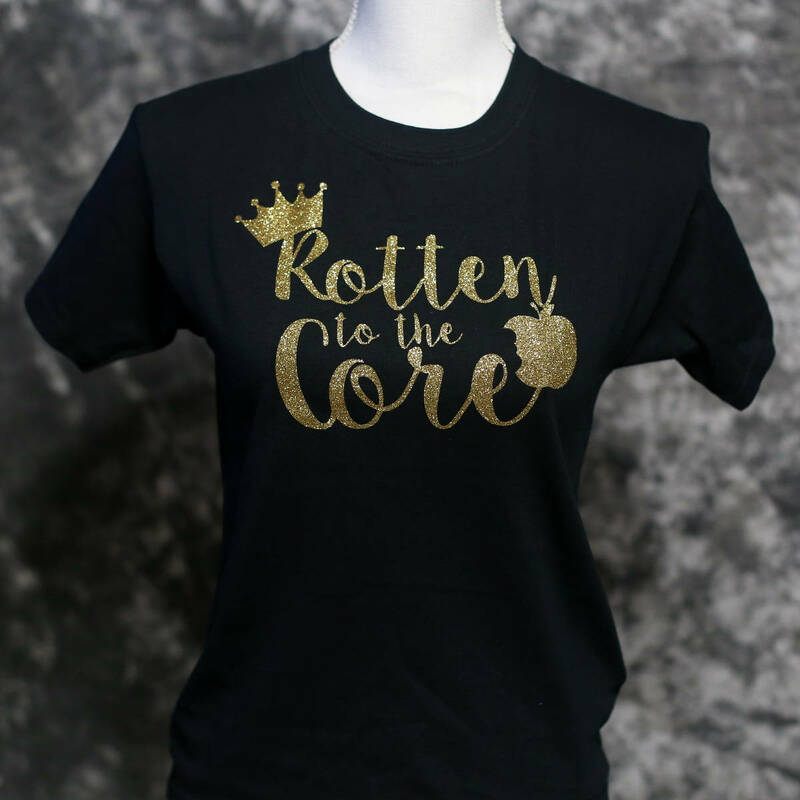 The glitter Rotten to the core will not fall off shirt like many other glitter shirts. Ladies shirt are more fitted but not Missy. Youth sizes run larger than Walmart's sizes. Disney Descendants Uma Whats my name ! The glitter design is cute but the quality of the shirt material is terrible. I wore it to Disney and had to buy a t-shirt at the park because i was getting so hot and bothered. Sorry. Super cute shirt! My neice is going to love it! We press our shirts with a professional heat press, We use high quality vinyl or transfer paper and ink and use a business printer. We cannot guarantee that your design on your shirt will be the EXACT same colors as the colors on your monitor , this is because every computer monitor is different and shows every color differently and every batch of ink has slight differences too.For example: If something is pink on the screen, it will be pink on your shirt but it might not be the exact same shade of pink you see on your computer monitor. The size of the design might also slightly differ from what you see in the photo's. Everything we do is by hand, this way every shirt is unique. Of course the size will be about the same as in the image.